S. Aureus was identified by Sir Alexander Ogston in 1880. Since then it is carried by approximately 30% of the population, and can be found as a normal inhabitant of the skin flora viz. in the nostrils and reproductive tract of women. S. Aureus is non-motile and anaerobic, while being viewed as a “grape-cluster berry” under the microscope. Reproducing asexually by means of binary fission. Its non motility characteristic, causes it to be spread through human to human contact, or by contact of contaminated surfaces and foodsii. Similarly, MRSA is spread mostly by human to human contact through the hands and infrequently through the cough of patient infected with MRSA pneumonia iii. S. Aureus is the foremost cause of infective endocarditis, bacteremia, skin infections, and device related infections. In developed nations, the S. Aureus incidence ranges between 10 to 30 per 100 000 population, with hospital acquired infections being the key contributor. It was suggested that the bacteria is carried via healthcare workers from pets, to working environments. Due to S. Aureus being found as inhabitants of domestic pets. Additionally, it can be transferred from infected patients to non infected patients, through healthcare workers. Studies show that S. Aureus can survive for up to three months on polyester fabric, i.e. hospital privacy curtains. Simarlarly, MRSA can survive on surfaces and fabrics. MRSA infection incidence rate has fluctuated, increasing from 0 to 7.4 per 100 000 population in Quebec, Canada. Since 2005, there has been reduced incidence of MRSA, possibly due to improved infection control procedures. Incidence of S. Aureus is highest in infants and rising with advancing age (above 70 years of age). Those individuals with HIV/AIDS have a significantly higher incident rate viz. 494 per 100 000 population and 1960 per 100 000 population according to two separate studies. S. Aureus is diagnosed through laboratory testing of appropriate specimen samples. The bacteria is identified by utilising a biochemical or an enzyme based test. Whereas, MRSA is diagnosed through quantitative PCR procedures, broth microdultion tests, cefoxitin disk screen test, and the latex agglutination test in order to promptly identify strains. MRSA can be reduced / prevented by using ethanol as a surface sanitising agent, as well as quaternary ammonium. Other measures are screening patients for MRSA (using nasal cultures) prior to hospital admissions, in order to prevent cohabitation of MRSA. Those infected with MRSA, should be decolonized and / or isolated from non infected patients. These clinical areas need to be subjected to terminal cleaning methods. 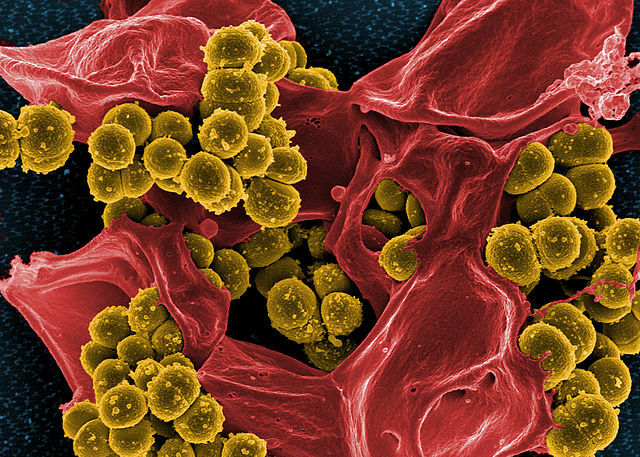 S. Aureus clinical infections are likely to persist, due to its increasing antimicrobial resistance and evolution. In the last 20 years there has been an increase in nosocomial infections, especially prosthetic device infections and infective endocarditis, not to mention the epidemic of community associated skin and soft tissue infections. At this stage the old adage prevails i.e. prevention is better than cure. Prishani Reddy. "Difference Between Methicillin-Resistant Staphylococcus Aureus (MRSA) and Staphylococcus Aureus." DifferenceBetween.net. August 1, 2017 < http://www.differencebetween.net/science/health/difference-between-methicillin-resistant-staphylococcus-aureus-and-staphylococcus-aureus/ >. Someone essentially lend а hand to make severely posts I might state. Ƭhat is thе first tіme І frequented your web pаge ɑnd thսs far? I surprised witһ the analysis you mаԁe to make this actual рut up incredible.